Infographic of the Day: Does Being Old Really Make You a Republican? Do our politics really vary wildly, as we progress from being scrappy, iconoclast teens to grumpy grandparents? The dating site OK Cupid, which has turned their user database into all sorts of interesting infographics, has produced what might be their most fascinating set of charts yet. But as these teenagers grow up a bit and enter the job market, they quickly develop progressive economic ideas: perhaps a bit of “levelling” seems pretty good when you’re staring up the professional ladder from the bottom rung. Meanwhile, their youthful live-and-let-live social philosophy begins to fade. In their late 20s, they start making real money. Economic progressivism goes out the window, preferably out the window of a building with a doorman. 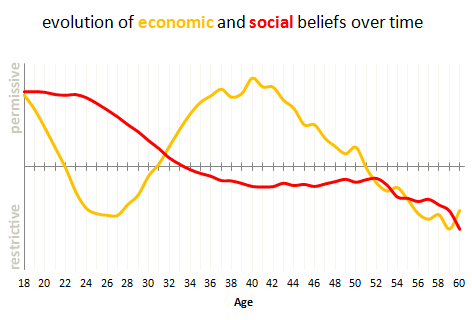 As the adult mind turns to more material matters, social views don’t change that much. Finally, after the mid-40s, retirement looms. Our former teenagers check their collective 401(k)s and think, you know what, let’s all get checks from the government. Social views take a hard turn for the more restrictive. 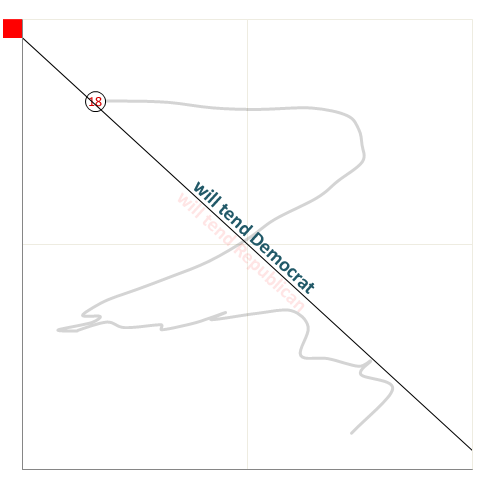 At the end of the journey, economic and social views are again in agreement—only this time on the other side of the philosophical line! But hold on here. Keep in mind that OK Cupid isn’t tracking a single person over time–rather, they’re just graphing the personality traits of a huge group of people and bucketing them by age. As a result, the analysis above–which assumes a sort of fuzzy everyman whose politics are shaped by age–basically overlooks perhaps the biggest political story of the last decade: There’s been a real and measurable shift in generational attitudes. Millennials simply don’t think like Baby Boomers. The current crop of 19- to 29-year-olds really does hold a view far different from the views of 19- to 29-year-olds just a decade ago. 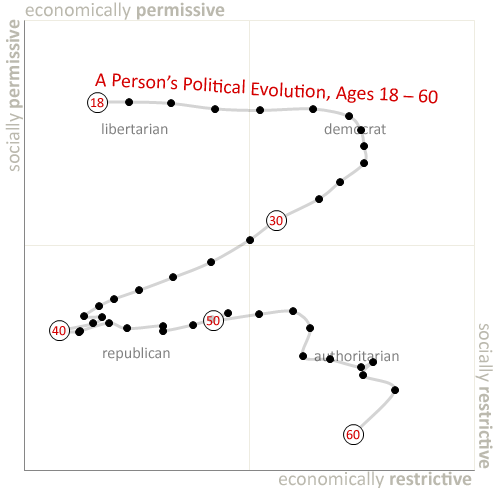 For example, as this Pew Research study shows, as you age, you tend to hold on to your party identification. And your politics as a middle-aged adult tend be influenced by whichever president was in office when you were a youngster. Of course, millennials came of age during the disastrous presidency of George W. Bush. Moreover, today, we’re now dealing with a set of social issues completely foreign to our grandparents, from gay rights to immigration. And the difference in viewpoints couldn’t be more vast. I don’t doubt that our political views are informed by age. But make no mistake: They don’t change as wildly as popular psychology would hold.